Warmup provides some of the best underfloor heating systems in the UK and internationally, and we are proud to sell Warmup products at Atlas Ceramics. Whichever system you end up using in your home, you will need a thermostat, and we sell a large range of Warmup Thermostats in our store. Below is some more information to help you choose your thermostat. Warmup provides some of the best underfloor heating systems in the UK and internationally, and we are proud to sell Warmup products at Atlas Ceramics. Whichever system you end up using in your home, you will need a thermostat, and we sell a large range of Warmup Thermostats in our store. Here is some more information to help you choose your thermostat. Every electric underfloor heating system requires a thermostat to work properly. You install the thermostat in the same room as the heating system, and you can then use it to turn the heating on and off as well as control the temperature. As well as simply turning the heating on or off, some thermostats allow you to programme in times and temperatures so you can set your heating to come on before you arrive home from work to ensure the room is warm when you arrive. This can make your home more comfortable and can also help to make your heating system more efficient, saving energy and saving you money on your bills. In addition, Warmup has a number of even smarter thermostats that can help to make your heating system even more convenient and efficient. Why Choose Warmup for Your Thermostat? Warmup is one of the best manufacturers of underfloor heating systems. It always uses high-quality components to create systems that are efficient and durable. Its thermostats have many benefits that you would expect from Warmup. Strong, robust and made to last. Easy to set up and operate with no complicated details to work out. Stylish designs in various colours to ensure they look good in your home. Most thermostats come with a 3-year warranty. Thermostats include smart features like WiFi and the latest tech. They all work with Warmup’s underfloor heating systems, so if you have decided to go with Warmup, it makes sense to choose one of its thermostats as well. We sell four models of Warmup thermostats at Atlas Ceramics. These range from basic manual models to thermostats with the most advanced technology. Here is some more information on these models to help you decide which one is right for your heating system. 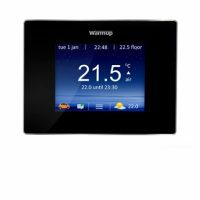 The Warmup 3iE Thermostat is a touchscreen programmable thermostat that you can use to quickly and easily set up to turn your heating system on and off at certain times of the day. 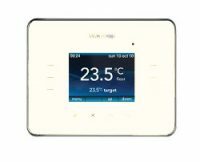 It has a 2.4-inch colour touchscreen, and the interface is simple to use so you can set it up quickly out of the box and programme your heating system with ease. It also detects the temperature of the room and adjusts automatically to keep you warm and comfortable. The thermostat boasts a stylish and sleek design, and it comes in a wide range of colours so you can easily find one that matches your room. An upgrade to the 3iE, the Warmup 4iE Thermostat comes with even more features, and the biggest upgrade is the WiFi connection. 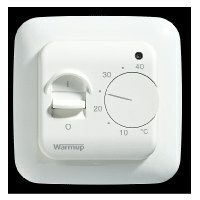 With this, you can connect to your WiFi and operate the thermostat from your smartphone using the MyWarmup app. 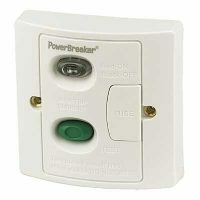 Not only can you set it to turn on when you are away from home but you can also set it to turn on based on your location. With its SmartGeo™ technology, the thermostat can work out how far you are away and how long it will take for you to get back home to ensure your room is the right temperature when you return (your data is encrypted and therefore secure at all times). It also comes with energy-monitoring tech that automatically controls the temperature when you are not home, making it more efficient. Warmup suggests this can save up to 25% of energy usage. 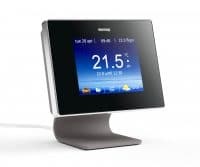 The colour touchscreen is easy to use, so you can set up and program the thermostat in minutes. You can also customise it with themes and photo backgrounds, and it even has a 7-day weather forecast. It also has a stylish design that will look great in both modern and traditional homes. The thermostat is available in Onyx Black and Bright Porcelain versions. This simple thermostat can be programmed to turn your underfloor heating on and off at certain times of the day. The display is clear and simple, making it easy to operate, and you can quickly see the programme details and set it up based on your daily routine. It also has a Proportional Adaptive Function to work out how long it takes to warm up the room so it can set the heating to turn on at the right time. This helps to reduce energy usage and save you money on your bills. The Warmup MSTAT Manual Thermostat is the simplest thermostat in the Warmup range. It has basic manual controls that you can use to turn the heating on or off and then set the temperature you want. It’s very easy to operate, and it has a stylish and simple white design. It is solid and durable, and if you just need a simple thermostat, this is a great option. You can now get 35% off your Warmup thermostat when you buy it from our store. We have slashed all our prices on Warmup smart products at Atlas Ceramics, so now you can get your thermostat and other underfloor heating products for less. But hurry, the sale won’t last long! You might need some help installing your smart thermostat. For example, in a retrofit installation with drywall in place, the mud-ring and the backbox have to be installed behind the drywall. If you have good DIY skills, you might be able to do this, but it is often better to hire a professional. Also, make sure all the connections and the cable work is carried out by a qualified electrician rather than attempt to do it yourself. Buy your Warmup Thermostat directly from our store today and we will deliver it straight to your door. Whether you’re looking for a simple manual thermostat or a smart touchscreen WiFi thermostat, we’ve got what you need. And if you have any questions about our thermostats or any of the other Warmup products we sell at Atlas Ceramics, we’d love to hear from you. We’ve linked each product to a warmup pdf guide that you can download. It offers the user operating instructions, giving you confidence that your monitoring system is working as it should be, showing you where the home is heated. The control is simple to use, with a touch screen interface giving you the ability to check the individual floor and stairs are heated to the state you desire. Warmup is one of the best electrical heating solutions for your tiled floors. Browse our shop to see our amazing deals that we regularly run across all our warmup supplies.